The Nissan Titan was developed in 2004. It was the first pickup in Japan to truly possess the characteristics that buyers normally expect from a full-size truck. It was offered in 4-door crew cabin and 4-door extended cab versions available in XE, SE and Top-of-the-line LE models. Nissan Titan comes with a 32 valve 5.6 Liter engine that can generate 317 horsepower and 385 ft-lb of torque. It is available either in rear-wheel drive or 4-wheel drive and has a 5 speed automatic transmission. The most notable changes came during 2008 that included new interior and exterior styling features. Until 2010, side airbags and side curtain airbags and stability control were not a standard feature on all Titan models. Power adjustable pedals are optional on SE, but standard on the LE. In 2011, new trim levels were introduced which included the S, SV, SL, and Pro-4x. 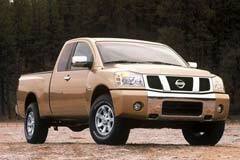 Used Nissan Titans are a good option to look at for a person looking for a used late-model pickup. 2016 Nissan Titan XD SV Crew Cab 2016 Nissan Titan XD SV Crew Cab Low Miles!! Ready To Go!! Must See!! Wont Last!